"Force of nature" is a small diorama showing the roots of the tree overpowering the human-made structures. My time is up, so this are the final textures for the asset. The wall and floor is 4096x4096, the metal parts and the roots are both 2048x2048. 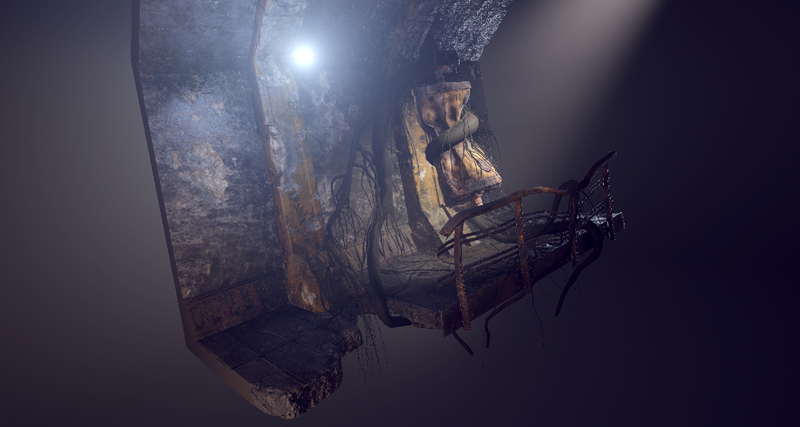 Software used: 3Ds Max, Substance Designer (baking) and Substance Painter for texturing. The final scene in Unity uses HDRP. Some other software I used as an experiment (generating low poly meshes and UVs automatically) with mixed results (I describe those attempts below) - Houdini, ZBrush, Instant Mesh. I've also used Allegorithmic's Alchemist to get a quick mix of certain materials and or add a small puddle of water. It took me about two days to finish the project. I've spent waaay to much time tweaking things in Houdini. I know that with enough prior experience this would have worked much better. Definitely something I will be looking more into, but it's not as flawless as advertised. Things I was planing on doing, but run out of time: 1.polishing the root material and creating a main set of maps and detail maps 2. adding some ruble and other scene fillers. With very little time left I can finally move to Substance Painter! Small update and another experiment, this time with Allegorithmic's Alchemist. Getting a moss-covered, broken concrete with puddles of dirty water in under 10 minutes? No problem! Houdini game dev tools are still not 100% reliable (in theory they are 'one-click' SOP that gets you from a high poly mesh to a full set of baked maps and a low poly mesh). One could adjust the high poly model workflow to fit the way Houdini processes the mesh, but I've spend way to much time tweaking the parameters and the computation takes too much time to experiment quickly. Not a good option if you're in a hurry. Also it crashed a few times and gobbled my 64 GB of RAM effortlessly. The automatic UV generation, as in any other existing software is just horrible. ;-) This is still an unsolved problem in computer graphics, so I wouldn't hold it against Houdini if it wasn't for overlapping UVs in a few instances, which is a big no-no for baking. Zbrush. Zremesher combined with other tools for creating a watertight model out of complex, kitbushed geometries will get you quite good results, but similarly to Houdini it's not 100% problem-free (especially if you're aiming at getting the polycount really low) and as always UVs are less than perfect. This means I'm almost done with low poly meshes and UVs and I have a full day to finish the project. Easy-peasy. Few hours behind the schedule, but I have finished modeling the highpoly version in 3DS Max (with some procedural root growing!) and off to sculpting for some final details on that crushed storage tank. As I won't have the time to create high quality UVs and mesh for such a complicated geometry manually, I will resort to using automatic UV generation as well as creating an optimised low poly geometry. Without the time constraints I would not recommend trusting the automated tools to do a proper job, but at least it's a good excuse to test the game dev tools inside Houdini. In terms of material breakdown I plan to create three sets: 1. wall and floor (for consistent texel density might be 2x the resolution) , 2.pipes, railing and other metallic surfaces and 3. the roots and organic materials (this one needs to be tileable since our small roots won't have baked maps). I have around two days of free time to finish this, so I'll be focusing mainly on working fast and utilising Substance Designer/Painer procedural workflows to cut some corners without sacrificing quality. AndrewCool, It'll be neat to see what can be done with only a couple days! Sometimes it's better to work with constraints and limits. Makes you focus on the important parts ;) Two days isn't a lot of time, but it is doable. Cool, It'll be neat to see what can be done with only a couple days!